i would imagine i've probably mentioned it before, but i'm very much a long-sleeve sort of chap. it's a predilection that morphs into arm-warmer use come the summer months, and possibly on two days (one in july and one in august), i become a thrillseeker and resort to short sleeves. however, the latter for me at least, is the equivalent of tightrope walking across niagara falls without a safety net. because i like long sleeves. meanwhile, though in reality the difference is probably quite minimal, getting caught in the rain in short sleeves is not a sensation i particularly look forward to. and donning a waterproof jacket over bare arms is every bit as uncomfortable as getting wet in the first place. either of those can easily be ameliorated by wearing longer sleeves, particularly in the latter case where any potential clamminess can be offset by the extra material from elbow to wrist. the icing on the cake that shifts favour inevitably towards the more extensive form of apparel, are the cuffs themselves. for if the jersey has been thought through to its logical conclusion, they will not abruptly end prior to the wrist bone; the feeling of security is substantially lessened if this is the case. 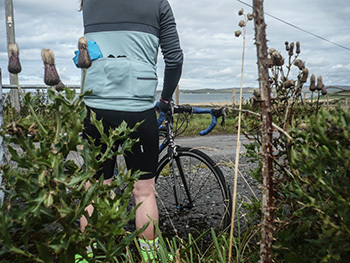 i'm sure i need not tell you that any sort of gap between the end of the sleeves and the beginning of track mitts or winter gloves is tantamount to being caught with your bibtights down. i definitely like long sleeves. i've no idea if rapha know of this or not, though i'm sure if i've told you, then i've probably told them too. 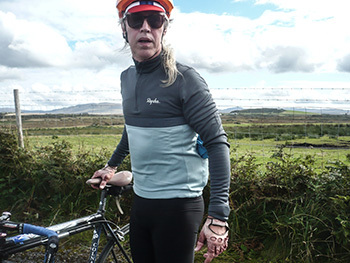 i have two long sleeve rapha jerseys in the second drawer from the bottom of the cycling wardrobe (it's not a real wardrobe, but for the purposes of our discussion, let's pretend it is), one of which is over eight years old and apart from an inadvertant mark on the left sleeve, it looks pretty much as it did when i took it from the packet. 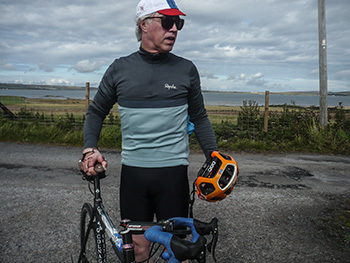 it is not, however, a rapha club jersey, the example of which recently arrived surely puts everything else in the shade (a hebridean joke). sportwool has never felt so good. though the aspiring professional within is honour bound to appreciate a full length zip, the quarter-length on the club jersey is actually more amenable to my senses and likely my previously discussed insecurity. and if we can for a moment descend into the world of personal aesthetics, the zipless lower-section is generally more flattering to the ageing figure. the svelte are probably quite well catered for also. while dave brailsford has worked tirelessly on those much-quoted marginal gains, it seems eminently possible that, in a manner not entirely unlike the hypothetical merging evident in flann o'brien's third policeman, some of those gains have rubbed off at imperial works through their partnership with team sky. simply pulling on this latest version of the club jersey is akin to the luxury that cyril lord once told us we could afford. quite frankly, i could have written a highly flattering review without ever having made it to thewashingmachinepost bike shed. aside from the concealed story label, hidden inside one of the three rear pockets, this heavier sportwool perfection also features a zipped security pocket and an internal mini-pump sleeve in the centre pocket. 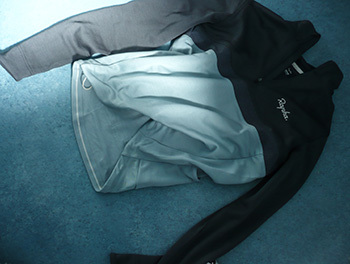 the fit, comfort and build quality are more than we've come to expect from rapha. 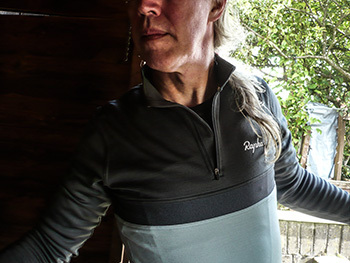 aside from an adjustable cord in the hem, a collar that really makes you wonder why the professionals opt for the minimal alternative, the sleeves truly come into their own when in the saddle and reaching for the brake hoods. 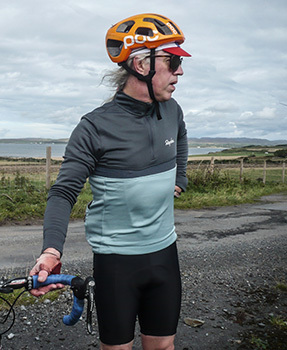 this is not the long-sleeve brevet jersey, it's not simply a long-sleeve jersey and it most definitely is not the long-sleeve pro team jersey. it's a long-sleeve club jersey clad in superb new colour options that distinguishes it from those mentioned above. the example reviewed is classed as grey/blue, but there's also the choice of black/grey or dark red/orange in every size from xs to xxl for which a price of £110 seems more than amenable. for those of you who figure a pro-team demeanour is perhaps just one sprint too far, and there are more than just a few occasions when i'd include myself in that subset of the venn diagram, this is most definitely where winter begins. sheltered 'neath a softshell, hardshell or gilet (delete as applicable) from now till next may, seems far less onerous than could once have been the case.